The Short Version: For this entry in the long running, but short on logic Santo series, the indefatigable Silver Masked Man of Mystery is a secret agent for the 'Organization of Planet Security' who, in his spare time, enjoys romancin' and wrestlin', but not always in that order. This time it's a flimsy Atlantean plot devised by a deposed Nazi scientist bent on nuclear destruction aided by stock footage from Japanese giant monster movies and Italian muscleman epics. It's a terrible film, yet hopelessly entertaining and will put a submission hold on your brain if you attempt to make sense of it all. A Nazi scientist named Aquiles (like Achilles) rules over the lost city of Atlantis; which happens to be hidden--and I use that word loosely--beneath a small island. This Third Reich renegade threatens civilization with a nuclear attack from space via stock footage from GODZILLA VS. MONSTER ZERO should they not comply with his demands. Aquiles's typically evil Nazi plan is to enslave mankind and rule with his own super race of beings... but not if Santo and Blue Demon have anything to to say about it. El Santo, Masked Wrestler supreme, keeps himself busy with a day job as a government spy working with Professor Gerard to locate up and coming Mexi-Führer Aquiles and the lost city of Atlantis. On a slow day in the spy game, Santo engages in a two out of three falls match with his rival, Blue Demon. During the fight, Blue Demon is drugged and quickly whisked away by Aquiles' thugs. Since the match must go on, Santo pursues, but loses them during a high speed 35 mph car chase that ends with his car crashing down an embankment. Upon arriving in Atlantis, Blue Demon's skills and strength impress Aquiles enough to offer the wrestler a place in his army. 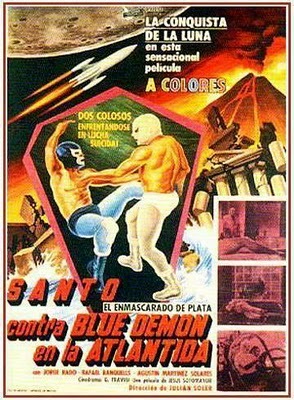 Refusing to join them, Blue Demon is hypnotized through a multi-colored mind controlling device and sent after Santo. At the same time, El Bond Enmascarado de Plata searches for the villains lair battling numerous bad guys, spies and Blue Demon in a bizarre "dog fight" with helicopters. Santo is eventually captured and hynotized by Aquiles' deadly disco ball of doom. He's then sent to kill professor Gerard and wreck his lab. The plan fails when a couple of those nonsensically bizarre "out of nowhere" instances of subterfuge arrive to confuse you just prior to Santo and the Demon making Aquiles and his forces black and blue. After setting explosives, the mountain base is blown to smithereens via stock footage from the endings of HERCULES & THE CONQUEST OF ATLANTIS (1961) and WAR OF THE GARGANTUAS (1966)! Yes, this is a milestone in cult cinema where masked wrestler movies intersect with Italian muscleman epics and Japanese monster mashes. Lucha Libre Mexi-movie madness strikes again with this double drop kick flick featuring two masks for the price of one. Santo and his real life wrestling ring rival, Blue Demon, go mexo-a-mexo for the bulk of the movie. Predictably, and as usual, they join forces during the climactic budget blow out beneath a swimming pool doubling as the ocean. SANTO AGAINST BLUE DEMON IN ATLANTIS is easily one of the worst of the series which, strangely enough, isn't a condemnation considering the Geiger Counter for entertainment value is off the charts in this one. It's reliance on stock footage from other movies, bad photography and messy editing is like an open challenge to Ed Wood from director Julian Soler. For instance, Aquiles is supposed to be this former Nazi scientist, yet his rockets are adorned with the Japanese flag and other Kanji (stock footage from MONSTER ZERO). The scenes from HERCULES & THE CONQUEST OF ATLANTIS (1961) are also obvious, at least for those who are familiar with that movie. One scene has Santo enter his apartment only to find a naked woman lying on his couch. Suddenly, the lady is exiting his bedroom wearing lingerie! Later in the movie, Santo is captured and seemingly put under hypnosis by Aquiles. Then, Santo enters the lab of professor Gerard and promptly begins destroying things. All of a sudden another Santo shows up--the real one, and kills the double revealing him to be one of Aquiles' operatives. No explanation is given as to how Santo had escaped. If it was, it was in Spanish as this movie had no English subs. Either way, we never visually see how Santo managed to escape Atlantis. The photography is equally chaotic. The cameraman must have drank too much Sangria during the shoot as the camera is occasionally too low, or out of focus. Also, the camera tripod is clearly visible (see above) during a scene where Santo realizes Blue is under the influence of the Atlantean Nazi madman. The fights are plentiful with bodies being pounded, punched, flipped and kicked with rapidity. Santo only gets to tango in the ring once here; during the first twenty minutes, he and Blue meet in the squared circle for a two out of three falls slug fest. We never do get to see the tie broken once both men get a three count on each other. Blue's win is a brutal highlight, though, culminating in a flying head smash from the top rope to Santo's solar plexis on the concrete floor. Blue Demon (erroneously billed here as Alejandro Cruz) was one of the most popular Mexican wrestlers who got his own series of crazy Luchador movies. While they reportedly weren't friends in real life, Santo and Blue Demon's wrestling ring rivalry spilled over into the films they did together. From those I've seen where Blue co-starred with Santo, Blue Demon always ends up being controlled by the villains till he comes to his senses during the conclusion where he joins El Santo in beating the holy hell out of the remaining bad guys, or monsters. In this way, Blue Demon doesn't have to be made out to be an intentional villain in Santo's movies, considering his offscreen popularity. Some of Blue's movies include BLUE DEMON VS. THE INFERNAL SPIDERS (aka HELL SPIDERS ), BLUE DEMON VS. THE INFERNAL BRAINS (1966), THE MUMMIES OF GUANAJUATO (1970) and THE CHAMPIONS OF JUSTICE (1970). The villains lair is the usual cave set from other movies dressed up with flashing lights and cardboard devices that are supposed to look both scientific and expensive. To put this in perspective, Soler's movie makes any of Bert I. Gordon's big bug flicks look like THE TOWERING INFERNO by comparison. The score by Gustavo Cesar Carreon is good, but in a Saturday Morning Cartoon, Hannah-Barbera kind of way. Never a dull moment, the fact that there are no monsters might mean a no-sell for some fans of these films. Lovers of bad movies will likely end up with heart burn from eating this over-stuffed, flavor-bursting, bean burrito. This review is representative of the Lionsgate double feature DVD paired with the B/W version of SANTO & BLUE DEMON AGAINST THE MONSTERS. There are no English options.